Please refer to our stock # M133 when inquiring. For festivals including her wedding, a Yao girl of marriageable age would wear the traditional "celestial crown" clipped to her hair on the top of her head. 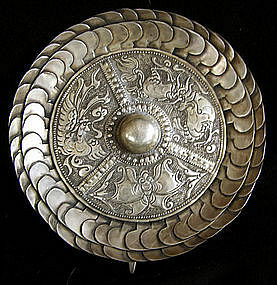 This traditional ornament was common among the Yao of Laos, Thailand and China's Yunnan Province. Upon reaching puberty, the Yao girl would be expected to make her own crown following traditional patterns and methods of her local region. For some, the celestial crown would be worn as daily ornament, while other Yao groups would reserve the wearing of the crown for ritual and festival events. The clip is 6 inches in diameter.